Many species of fish, such as the brown trout pictured on the left, hatch in streams and then travel away from those streams in order to mature. However, when it is time to reproduce, they end up navigating back to the same stream in which they hatched so they can spawn there. How do they accomplish this? How do they know where they are and which way to swim in order to get back to that special stream? Based on behavioral studies, scientists have thought that these fish are able to sense the earth’s magnetic field and use it as an aid in their navigation. However, the specific source of this magnetic field sense has been elusive…until now. A recent study has shed a lot of light on this magnetic sense, at least for trout (and presumably other similar fish, like salmon). The authors of the study set out to determine what gives the trout their magnetic sense, and they developed a rather ingenious method to aid them in their search. 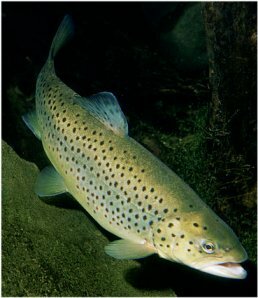 First, they took tissue samples from the trout’s nasal passages, because previous studies indicated that there was magnetite (a mineral that reacts strongly to magnetic fields) in those tissues.1 Then, they put cells from the tissues under a microscope and exposed the cells to a rotating magnetic field. In response, some of the cells rotated with the field.2 You can actually see a video of this happening here! Just click on the links for downloading the movies. This is a very simple, very sensitive method for finding the cells responsible for the trout’s magnetic sense. As you can see from the video, the cells that are sensitive to the rotating magnetic field are smaller than the other cells in the tissue. Also, the authors found that only 1 in 10,000 cells in the nasal tissue have a magnetic sense. No wonder these cells haven’t been found until now! Of course, as the authors studied the cells more closely, they found evidence of thoughtful design. First, these small, magnet-sensing cells are significantly better at responding to magnetic fields than was expected. Previous studies of the magnetic field sense in fish led investigators to predict a specific sensitivity for whatever cells were able to react to magnetic fields. The authors of this study showed that the actual sensitivity of these cells is 8-200 times stronger than the previous estimates. Why are the cells so sensitive to magnetic fields? Because there aren’t very many of them. Thus, each sensor needs to be very good at its job. If they were as closely packed as photoreceptor cells in the retina or as hair cells in the inner ear, then they would interfere strongly with each other, because their internal compass needles would produce a locally strong magnetic field, which would be felt by the neighboring magnetic cells. Such a proximity would deteriorate the magnetic sense. So once again, we see an incredibly well-designed system in nature. The cells are spread out so that they don’t interfere with one another, and they are significantly more sensitive than previously thought so as to accommodate this design feature. Now one thing I have to point out is that the video does not show how these magnet-sensing cells work when they are in the trout. Because of the way the tissue was prepared before putting it under the microscope, the cells were free to rotate when exposed to the magnetic field. However, that’s probably not what happens in a trout’s nasal tissue. Instead, the magnetite is firmly coupled to the outer layer of the cell, the cell membrane. When the magnetite moves in response to the magnetic field, the cell detects a stress in the membrane. That most likely generates a signal, which is sent along the trigeminal nerve to the brain. In other words, the cells probably don’t actually move in response to the earth’s magnetic field. They probably just sense the force that it exerts on their magnetite. As the authors point out, their method of detecting magnet-sensing cells will allow investigators to more easily study the magnetic field senses of other animals. For example, they point out in their paper that it has been shown that the magnetic fields from power lines change the way cattle tend to align their bodies while grazing.3 Now that there is an easy way to detect cells that sense magnetic fields, researchers might get a better idea as to why this happens. 1. Diebel, C.E., et al., “Magnetite Defines a Magnetoreceptor,” Nature 406:299-302, 2000. 2. Stephan H.K. Edera, Hervé Cadioub, Airina Muhamad, Peter A. McNaughton, Joseph L. Kirschvink, and Michael Winklhofera, “Magnetic characterization of isolated candidate vertebrate magnetoreceptor cells,” Proceedings of the National Academy of Sciences of the USA doi:10.1073/pnas.1205653109, 2012. 3. Hynek Burdaa, Sabine Begalla, Jaroslav Červený, Julia Neefa, and Pavel Němecd, “Extremely low-frequency electromagnetic fields disrupt magnetic alignment of ruminants,” Proceedings of the National Academy of Sciences of the USA 106:5708-5713 2009. Stone-Age Animation One Gene = One Protein? Not Even Close!